JUMPANNY established in Taiwan in 1998, we persisted supply for good quality thermoplastic piping and valves system. So we manufacturing thermoplastic valves in order to offer the best prodcut to user, we always focus on developing innovative valves with top designs and performance, not just quality products. 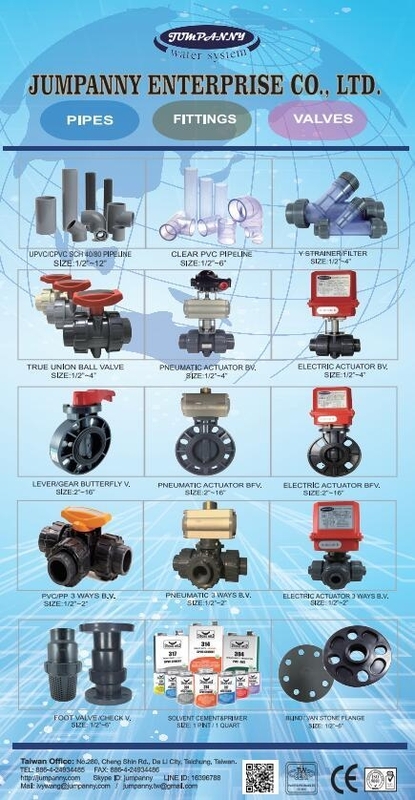 After more than 22 years development, now we could supply various thermoplastic valves in UPVC, CPVC, Clear PVC, PPH, HT-CPVC, etc., and all products are strickly produced as per international standards such as ANSI, DIN, JIS, CNS, NPT, PT, BSPF and so on. Unlike other suppliers who may directly assemble valves after molding to save costs, all JUMPANNY valves must pass CNC machine and other fine processing steps before assembly, and 100% testing before leaving our factorries. Also, all valves are specially added in UV powder to resist sunlight and enhance the life span. Besides, any CaCO3 or recycled materials are forbidden in JUMPANNY valves, as always stick to the quality lines and best services, and we believe this policy is correct. Our products are widely applied to industrial water, wastewater treatment, semiconductor, electrical prower generation, municipal and so on. We long-term care about customer needs and commitment to the quality, rather than just qualified products. What we advocate in the markets is not only sale products, but also technological innovation and cultural transmission, not only comparison of prices, but also promoting the value of enterprises. Attention: As you know the hacker is a very serious and arrogant, we remind you that if you have received any messages to order you to transfer T/T to other company, please contact us immediately. We just have company name of” JUMPANNY ENTERPRISE CO., LTD” and located in " Taiwan”. Please note!